The generator (1) voltage is connected to Be24 via the L1 & L3. We recommend that you protect the connections with 1A fuses (4). 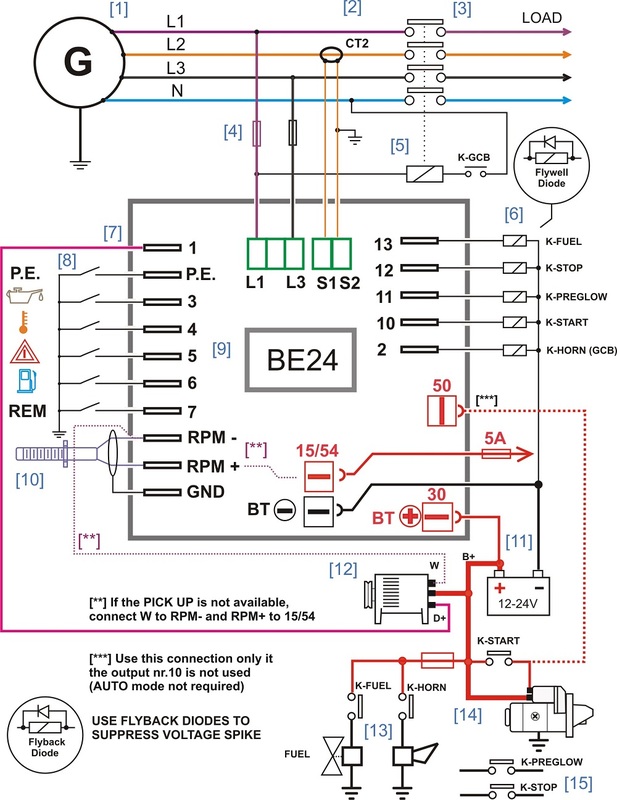 In case you need a Generator Circuit Breaker, you can drive the coil of it by using the digital output '2' (in this case the output to drive the horn will not be available). If you connect a dashboard we recommend that you protect the output 15/54 with a 5 Amp fuse. The outputs of the controller being 'static' require a pilot relay. The use of fly back diodes is mandatory. The Be24 detects the rotational speed from a pick-up or from the 'W' terminal of the belt alternator. If these devices are not available, the Be24 automatically calculate the rotational speed from the generator. In this case you are required to program the correct number of poles of the alternator. The generator controller connections are made by using blade terminals 6,3X0,8mm. The generator controller connections of the generator voltage and current are made by using removable terminal block.